Surveys of existing facilities should be performed by trained engineering professionals with the ability to identify hazardous conditions and to evaluate the adequacy of fire protection system designs, even if some hazards and deficiencies are subtle. ACC has that ability from over 25 years experience in conducting surveys in Health Care facilities, Residential and Business Occupancies, Correctional and Detention Facilities and Industrial Complexes. · Develop Priority List of Recommendations for corrective actions. · Prepare Cost Estimates for implementing recommendations. 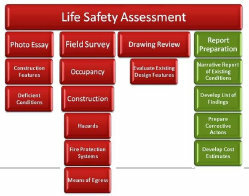 · Prepare Survey Reports, describing surveyed property, results of fire protection systems tests and analysis of emergency response preparedness. · Prepare Pre-Purchase Analysis of existing building fire protection and life safety features for compliance with applicable codes. We specialize in life safety surveys of hospitals, skilled care units and assisted living facilities; meeting the requirements of the Joint Commission for Accreditation of Healthcare Facilities and the Pennsylvania Departments of Health and Public Welfare.